Many thanks to those who attempted to answer the guess question on sunflower block. Most of you have got the Trellis part right. Let me fill in the rest of the details of the stitches used. I'd kept aside this part of the pattern specifically for Trellis family. Although I'd been admiring the Trellis stitch for a long long time,I'd not attempted it. Besides there was always a confusion - each time the 'Trellis stitch' looked different - sometimes spiral, sometimes straight and sometimes couched. So I decided to tackle this confusion and get rid of it forever through this block. 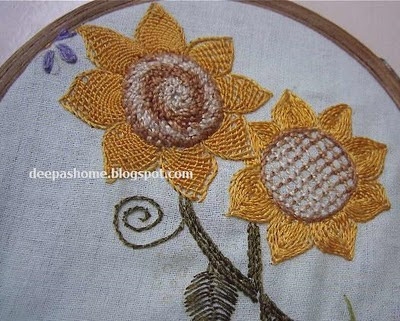 The petals are stem stitch filled using three strands of silk. Anchor perle cotton was used for the center. 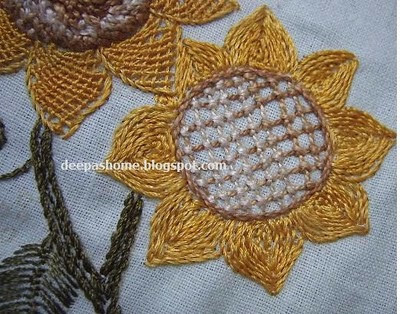 In this flower, I tried THE Trellis stitch. The name is confusing bcoz there's another Trellis used in pulled thread embroidery,and also in smocking.See this link . 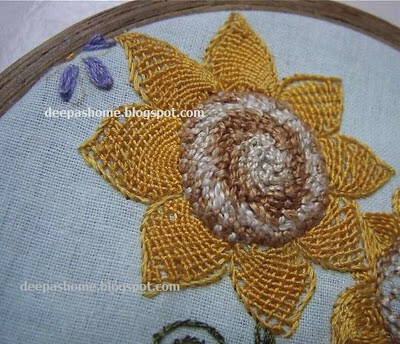 The center of the flower has been stitched with Spiral Trellis stitch. There are two very good references for this stitch over at thistlethreads in the form of a photo tutorial and at Just string. For the petals, I used the same method with three strands of silk .Here's how I did it. I outlined the petal with stem stitch.At the tip I made a small foundation stitch on the right outline and then covered it with a stem stitch. This foundation stitch is where I'll insert my needle for the wrap. Then started from the tip of the petal under the stemstitch on one side,inserted the needle into the foundation stitch from bottom to top ,wrapped the thread around the needle in the trellis way (over and under) and pulled the needle to form a knot. I then went down to complete the row . The first row needs only one knot. To start the next row,I came back to the left and repeated the above procedure on the bar formed in the previous row. This was repeated for all the rows. c) The direction - Mary stitches in both the directions.I've always stitched from left to right. Well, that completes my looooooooooong post on Trellis. I will be back with next block soon. I have to try it For sure! Sure,Meri. Pls ask in case you still haven't got it.I'll try and explain again. Hello Deepa. you are so talented. This design is so good. I too love embroidery a lot and used to be obsessed with it the way Iam obsessed about quilling now. I think I can pick up a lot on your blog.